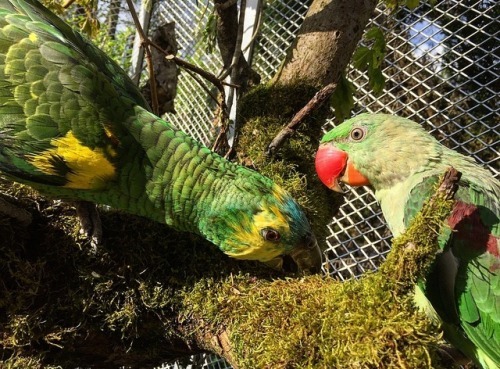 Parrot Forum • View topic - A hello and some flock updates! A hello and some flock updates! Hey guys! It's been a couple of years(!!) since I last visited this forum - so I don't know if anyone will remember me But I looked around the latest active topics and I sure remember some of you! It's good to see some familiar names even though there's not as much activity here as back in the day, I'll be reading through some recent posts to see how y'all are doing too! So, I was reminded of this forum when reverse-image searching my own bird photos to see where on the internet they've ended up.... I had completely forgotten about this place! 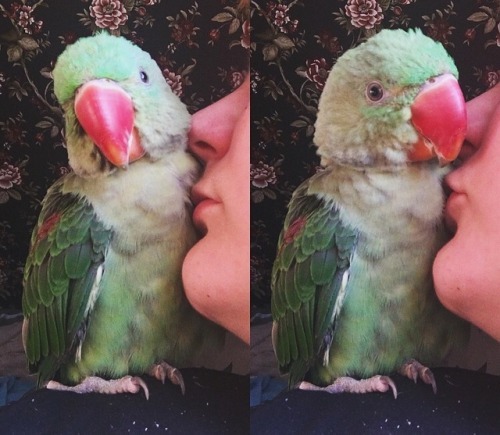 Well, I thought I'd make an update post on here since it's been so long (and I hope someone might appreciate a couple of cute bird pictures heheh)! Sorry, this post will probably be really long.. But scroll down for a shorter summary and a couple of pictures! So, since my last post on here over 2 years ago, a LOT of things have changed in my little flock.. Both good news and bad news. Well... Mostly bad, but the good ones really do weigh a lot! First, both Miley and Alaska the sennies passed away together - they both just.. died.. overnight. No sign of struggle or anything (I wasn't home at the moment, my mom was watching them for me, but she sent me pictures of the scene), they'd just kind of dropped to the bottom of the cage. We never did determine actual cause of death (this might be a bit of a weird and touchy subject but I MIGHT like to have them be made into a taxidermy memorial piece, so I will be leaving them for a post-mortem examination after they've been skinned by a taxidermist, if I decide to go through with that. Long story short: I would feel really weird just throwing them out or burying them. I also am a taxidermy apprentice and very comfortable around dead stuff. I don't know if I could deal with my own babies as taxidermy mounts though, so, we'll see.) - but there was a reported car fire right outside our house that night and I believe the window to the room they were in was cracked. Toxic smoke could have gotten inside. Would explain them both passing suddenly and at the same time, and all of the other birds being fine (they were in another room). 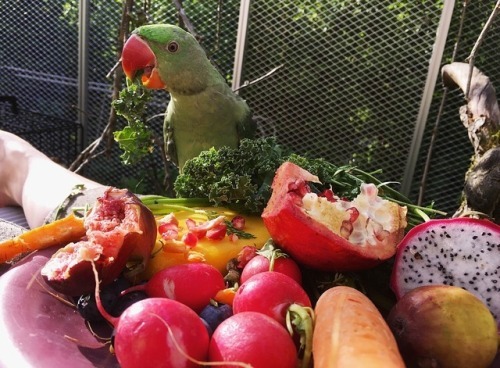 We'll hopefully get more insight eventually though, but, all of the other birds went in for a check-up and were all good and healthy, and that's the most important thing! I'm still heartbroken over Miley and Alaska though. I do find some peace in that they both died at the same time however, seeing as how bonded they were to eachother. Had only one of them died, I don't know how the other would've coped. Now they're still together even in death. 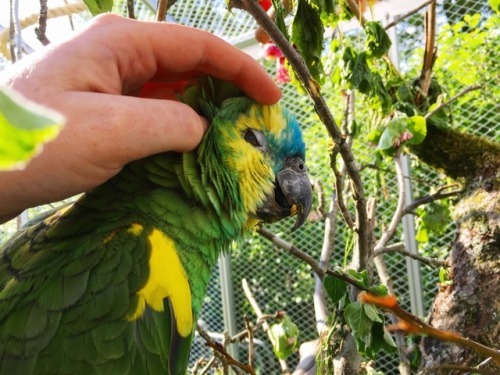 Second, I adopted a Blue-fronted Amazon! He was only 6 months old when I adopted him but I was already his third home. His name is Drogon and he is the funniest, cutest little troublemaker. A very smart little bird, a super fast learner, and a big and obnoxious personality He's pretty great. He's about a year old now and in a bit of a.. practicing new words when he thinks I'm not listening phase. :') I am very happy to have this crazy little bean in my life. Now, to the one incident that probably affected the whole flock the most. Nicko, my sweet and lovely old man IRN, also passed away a while back. Now, he was at *least* 20 years old (I believe his history is accounted for during the last 21 years - his previous owners got him 19 years ago and were told he was just a year old. He did, however, already have his ring at that point, making him at least 2 years old.. But very possibly older.) and hadn't been in the best of health for a while. We'd been coming and going to the vet's and most of his health issues were age related, so I knew he didn't have too long left. Not as much of a chock as with Miley and Alaska, but, just as heartbreaking. He was my little old man. ...And he left a bit of a mess behind. Meg, who's never been too much of a human-oriented bird, was also heartbroken over the loss of her partner. She wouldn't go near me at ALL (she's never had any trouble stepping up when Nicko's been around), she barely ever vocalized, and... She started going after the 'tiels. Now, look, I know keeping IRNs and 'tiels together is generally a really bad idea, but Nicko was such a good 'tiel uncle! Whenever Meg would be annoyed by the tiels or whenever the tiels would try and collect courage to bother Meg on purpose - Nicko would step in. He'd like physically step between them, and... They'd always stop. Everyone listened to Nicko. ...But with Nicko gone that didn't work anymore. They were all pretty stressed out by the situation. Meg needed a new friend of the Psittacula complexion, and Jack & Ianto needed to... Not be anywhere close to Meg. I did consider housing them in a smaller cage, but, they were truly more suited for aviary life, and I wouldn't have been comfortable having them in a smallish cage and not letting them out to fly and play (Meg would viciously guard her aviary and go after their feet if they sat on top of it - and I could not let them out in another room because they weren't really tamed or trained and it would have been pretty difficult - especially seeing as I also have cats who are free to roam most other rooms, and the one room where there aren't any cats, I had Drogon the Amazon, which also wouldn't have been the best room for a couple of 'tiel brothers..) I just couldn't help but feel like I was unable to provide what would be best for them. So... 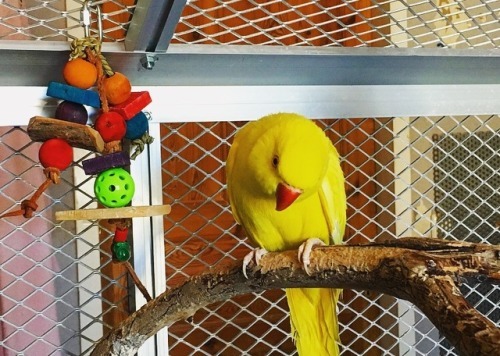 I found a lovely family with a little 'tiel girl who recently lost her partner, and I went over to their place to check it out and talk to them, and, ended up re-homing Jack and Ianto to them. 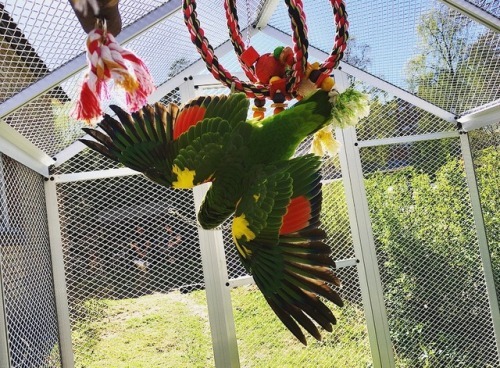 They now have a girlfriend, a dedicated human mom, and a big outdoor aviary! :') <3 I couldn't be happier for them, and I get updates and pictures all the time. Now, back to lonely Meg... Ringnecks and other Psittacula species have always seemed pretty unusual here in Sweden to me. I never see them up for adoption and I only know of a handful of other IRNs here. 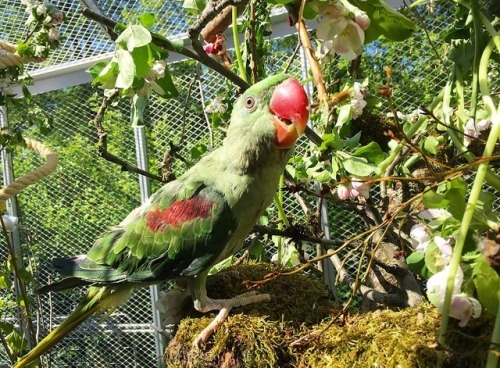 I know there are at least one IRN breeder but I don't want to get a baby from a breeder, I'd rather adopt birds in need of a home. And turns out... 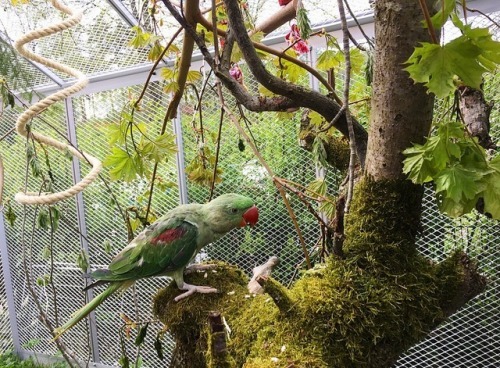 The first time I introduced them to eachother, I wasn't planning on actually having Leia stay in the aviary with Meg for more than the little while I also was there, but... After 30 minutes or so, they cuddled up together and went to sleep, and, they've lived together ever since. Meg is very much back to her old happy self again, and Leia made a perfect addition to the flock. Super laid-back, a sweet little tomato-face who loves kisses and completely DESTROYS literally any wooden toy she's given in a matter of hours with that gigantic woodchipper of a beak - and she's also good with Drogon (who I believe likes her more than she likes him - he's a bit intense for her taste.. but she'll indulge him in whistling competitions and they're both fine being out at the same time). 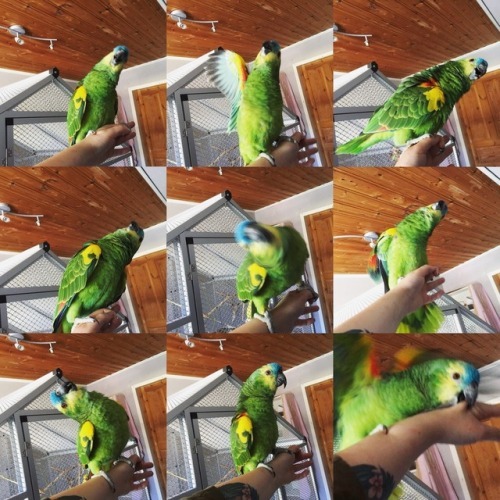 I adopted a crazy-person in the form of a very energetic young Blue-fronted Amazon named Drogon. He's a hoot. Old man IRN Nicko passed away from age related health issues and left everyone a mess. 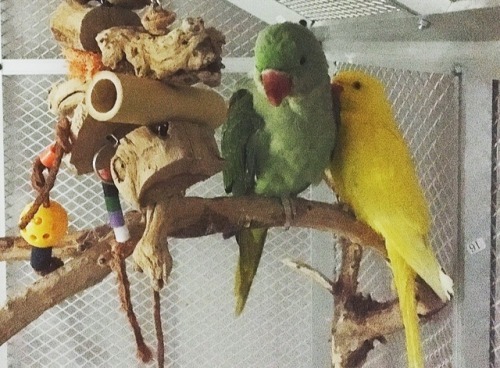 Jack & Ianto the 'tiel brothers found a great new home with an outdoor aviary and a cute girlfriend. 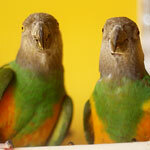 Meg was lonely, but found a new friend in Alexandrine Leia. 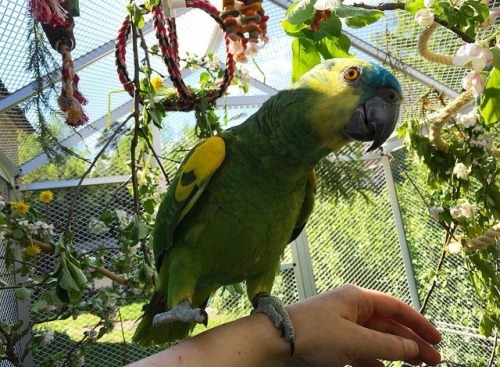 Leia is a sweet young girl with a thing for kisses, like most Psittaculas. 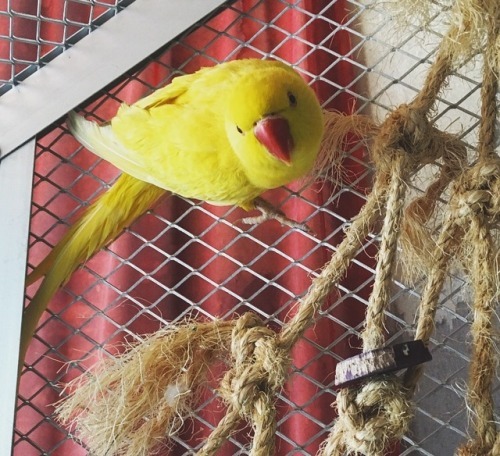 Oh, and - I too got myself an outdoor aviary just a couple of weeks ago! It's the best thing. Re: A hello and some flock updates! Thank you so much for the update! We love getting updates on everybody's birds. So very sorry about your loss. Senegals are real special small guys that leave a big hole when they leave... But it is great that you got your IRN accepting a new companion and I am glad that Drogon found you!